Bagpipers from several Piping bands take part in the Massed Band during the Opening Ceremonies at the CNY Scottish Games at Long Branch Park in Liverpool, New York, on Saturday, August 14, 2010. Nikon D700/70-200VR, 1/200s, f/7.1, ISO 200, EV 0, 200mm focal length. 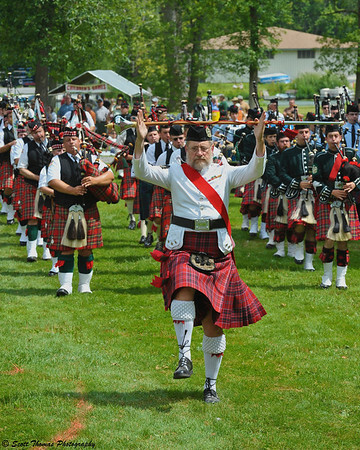 The Opening Ceremonies at the CNY Scottish Games featured the Massed Band where members of all the piping bands competing at the event come together and parade onto the band field. It was an amazing sight which gave me goose bumps. I would say there was about 500 bagpipers and drummers which made up the Massed Band. A band of this size needs a leader up to the task. That person is called the Pipe Major. The Massed Band paraded and played for a long time much to the delight of the crowd sitting on the sloped hills overlooking the band competition field. The Pipe Major and his Sergeants high stepping throughout the performance. One bagpiper of hundreds who took part in the Massed bands parade at the CNY Scottish Games at Long Branch Park in Liverpool, New York, on Saturday, August 14, 2010. Nikon D700/70-200VR, 1/200s, f/10, ISO 200, EV 0, 200mm focal length. 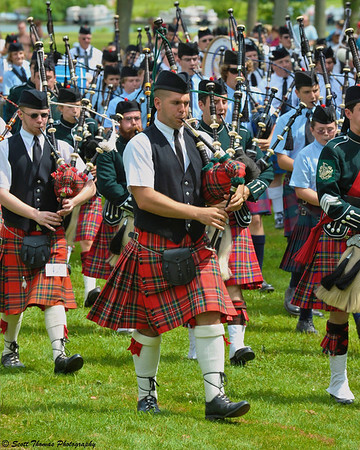 This entry was posted in Event, People and tagged 70-200mm, bagpipes, cny scottish games, drums, kilts, marching, massed band, men, music, new york, nikon D700, Photography, pipe major, syracuse, tartans, tradition, vr. Bookmark the permalink. Oh, Scott, you have no idea. Or then again, perhaps you do! You and the new camera are bonding very well. Having fun with the new toy are we?? Yes, I am enjoying the D700 very much, thank you! Thanks, Nye, glad you like those hairy men in kilts. Very impressive images ! I can almost hear the “sounds of music” ;)I like the first picture very much, all the different tartans, wondering what clan they belong to. Reminds me of my stay in Scotland… where I did wear a kilt ! It was in the blue/grey shades and I loved it. Birgitte, check out the link below in Carsten’s reply for information on the tartans used by Scottish clans. LOL, Scott! You are indeed VERY festive these days. Good summer isn’t it? I can almost hear the incredible noise music. No wonder their enemies fled from the Scottish soldiers. Is there anything in some of the comments that needs further explanation??? I found this: http://www.tartansauthority.com/tartan-ferret where you can search which tartran belongs to a given clan, or you can search by colors. I did not find the one on the above images. Thanks, Carsten! I think for bands they don’t use clan tartans and have own designs mostly. I did see a band using the Fraser tartan but they also used Fraser in the band’s name. Whenever I try to photograph an event, I never seem to know which subjects are most photo-worthy. Your collection of images seems to capture the essence of the activities just perfectly. Amy, I always try to research the event ahead of time. That way I get an idea of what will be going on and I key on events, things and people I find interesting. It is a lot like researching for a trip in miniature.